The name Wild Sheep Chase may sound more familiar to you on the covers of a Murakami book but here at Taman Desa, it’s a café. Adopting a minimalist look with its white walls and bare decor, the space feels bright and airy. This is well reflected on their menu as well as it only has five items so far. 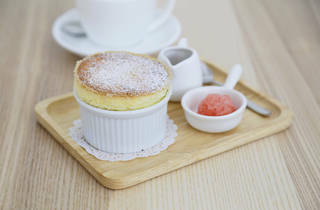 Everything is made to order – including their already famous soufflé, a Taiwanese recipe made with real vanilla beans and kampung eggs. 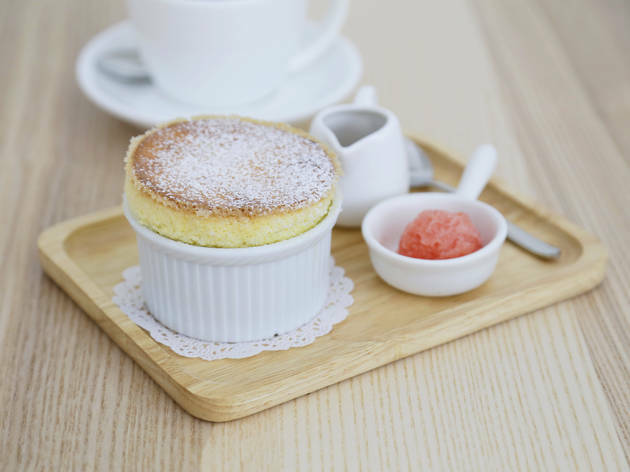 Word of caution: Get your photos and #foodporn shots as quick as possible (and by possible, we mean five seconds) before the soufflé starts sinking. As mentioned, all the food here is made to order so that means no lavish cake display or impressive array of pastries. That also means your order takes around 20 minutes before it arrives. To kill time, they provide some choice reading materials – travel books, independent magazines and of course, the café’s namesake, Haruki Murakami books.